This month’s outro music is Dr Who in dub courtesy of Smerins Anti social Club. Also if anyone can work out why a good reason why Alexis should mention root vegetables we would be most appreciative. Apologies for the sound quality of this episode. 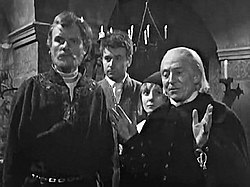 This entry was posted in Uncategorized and tagged doctor who, geek syndicate network, jacqueline Hill, maureen o'brien, peter purves, the chase, the crusade, the space museum, time meddler, william hartnell, william russell. Bookmark the permalink.